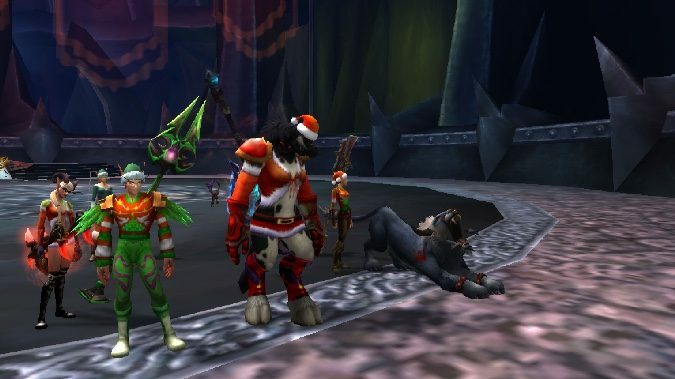 NEXT | What's your favorite wintery in-game holiday event this year? Holidays? Here? I’m not sure what you’re talking about. Q4tQ: patch 8.1 brought the first reward currency we’ve had for a while. Now that it’s been in for a while, what do you think? Are the rewards worth it for the time it takes to get the tokens? I think it’s all right so far – I like being able to work toward getting something again, instead of just hoping for good luck with RNG. I’ll have enough to get the krolusk mount soon, though the nightsaber is a much more distant goal. I just hope they don’t switch currencies when other warfronts get added. This is a tough question because what feels like too much or too little is a matter of personal judgement. In general I’m for currencies like service medals because they offer progression that’s not based on RNG: instead of grinding away and hoping for the right drop, you play until you’ve collected however much currency you need to earn the rewards you want. In this case, you earn five service medals per invasion quest, and rewards cost from 10 to 750 medals. That means you can get cheap rewards quickly, and be able to work towards anything more expensive at a decent pace, which will keep this from feeling as slow (or slower) than the usual RNG grind. That, in my opinion, is a good currency system. However, if we keep getting different types of currency in — which Blizzard sometimes does — it can get frustrating fast. I hope we stick with these service medals this expansion and don’t pile on extra currencies. Have you ever, in WoW, jumped to a new server and started from scratch (no boost)? Actually, that’s what I did with my current character! I took a WoW break after Cataclysm launched — my guild had fallen apart and with all of the class changes the game didn’t feel familiar anymore. So when I felt like playing again in Mists, I didn’t feel I had anything to go back to and started fresh with a new character on a new server. That was before the days of boosts, of course, but when you’re making a clean break from a server, I’m not sure how much a boost really helps. Sure, it gives you a leveled character with gear, but you’re on your own for professions and the gold you start with won’t last long. Leveling, particularly with heirlooms, is relatively fast, and you can get your professions started, collect transmog, and get a feel for your new server community as you go rather than simply jumping into the deep end with a brand new max-level character. If I found myself in a situation where I wanted to server hop again, I’d still lean towards leveling due to the expense of boosts. While they come free with expansions, a boost on its own cost as much as a new game, which really gives me pause. It’s likely that, if I were making the jump around expansion time, I’d use a boost, but otherwise I’d level. What would you play if the monk class was deleted tomorrow? Another healing class, though I’d have to have a think about which one. I started playing WoW back in Vanilla as a Gnome Warlock, and my very first alt was a Human Holy/Disc Priest that I rolled for a change of pace. But I fell in love with my Priest and she became my new main.. for a while. I faction hopped and started a new Priest (a Troll) and when Burning Crusade hit I became a Blood Elf Paladin. I loved the Holydin — I felt I could heal well (if not as well as my Priest), but I could also take a hit. Healing aggro was a big issue back in the day and it didn’t take much to bring a cloth-wearing healer down. My Paladin didn’t have that problem, though. I stuck with that character until Cataclysm, when I had a WoW nap, and picked up Monk when I came back in Mists. Now it’s four expansions later and I’m still a Monk, somehow. Right now, I do not do much group content in WoW. No LFR, no Expeditions, no random dungeons, and this is largely because I’ve heard how toxic it is. Using your own experiences, would you recommend that I give them a try, or do you think they’re still too bad? WoW has some stellar group content, and uses dungeons and raids to tell stories. (Though not always clear stories, like Uldir, which Horde players will see as story progression and Alliance players just see.) Raids and their stories used to be locked away behind the gate of guilds, because it was difficult to get large pick-up groups that could handle them in the days before LFR. If you weren’t in a raiding guild, you never saw the content. Today, LFR makes that possible, even easy. But there’s no denying that LFG and LFR can be dicy sometimes. You may wind up in a good group or you may wind up in a group full of people who are unhappy that not everyone in the raid is performing to their expectations. Sometimes that results in name-calling and vote kicking when all you wanted to do was run the dungeon. However, I feel like the occasional unpleasant player is the price we all pay for playing a multiplayer game. Just like real life, some of the people we meet are great and some are … less great. But I don’t think those less great people should keep you from doing things. There are tons of great players out there, and, honestly, you’re most likely to run into quiet players who just want to get this done. Many groups are quiet, and that’s not a bad experience. What I would worry about more than toxicity is the expectation that everyone knows what they’re doing. For dungeons, especially, which players have been running since day one, speed running is the way of LFG. Players are likely rush through without stopping to explain to someone who isn’t familiar — and that’s not a lot of fun if you’re trying to experience things for yourself. If you haven’t had a chance to go to a particular dungeon, a brush up on Wowhead or Icy Veins is a good idea before jumping into a random group. I complain about random groups a lot. A single bad experience can make you want to swear off the whole thing and never, ever group with people you don’t know again. But the truth is that I’ve been running random groups in WoW from Vanilla to the present day and I’ve had more good experiences than bad ones. And if you’re in a bad group that’s making you miserable? You can always ditch it and go do something else. But you shouldn’t let that bad group, or the fear of that bad group, keep you away from group content forever. What’s the current state of raid healing? Does it feel like it’s skewed towards area of affect heals or is it more big incoming damage spikes to tanks? Since tanks are the ones standing between me and big, hungry, Gnome-eating monsters, it’s in my best interest to keep them healed up… but in large part, it feels like I don’t have to. Of course I heal them, and when I’m specced into Jade Serpent Statue I leave that running on one of the tanks. But it feels like I spend as much time group healing as I do tank healing — and maybe more. I was curious as to how my “feeling” that I spend a lot of time group healing played out into actual statistics, so I went through my Uldir normal and heroic logs to see who was taking the most damage. In successful encounters, the two tanks were always at the top of the list — but not necessarily by a lot. In some fights, the main tank took as little as 11% of overall group damage while the DPS hovered in the 5% range. On average, I’d say the two tanks take between 25% to 50% of a group’s total incoming damage. That’s a lot of damage on the tanks — but it’s also a lot of damage hitting the rest of the group. Because the non-tanks aren’t nearly as able to mitigate damage as the tanks, it means doing a lot of AOE healing. Being able to keep the tank alive rarely feels like a make or break moment in a fight — it’s keeping the DPS alive so they can finish burning down the boss. There are exceptions. Fetid Devourer will occasionally hit the off-tank for 300% normal melee damage, which requires a tank swap and careful healing. Uldir trash is particularly brutal in places, and the trash before Zul, in particular, often leaves me chain-casting heals on the tank. But most of the time, I’m keeping a half eye (and a Jade Serpent Statue) on the tank while throwing heals on the group. There are even a few fights that are simply dull because the tank doesn’t take enough damage to worry about. On both Taloc and Mother I’m usually in melee range kicking the boss until I need to toss out some AOE heals. Damage to the tanks in both fights is steady but light enough to be healed with little attention, leaving me without much to do other than wait for the next batch of group damage to hit. (And kick things. Did I mention kicking things?) I kind of wish there were fights that required serious tank healing, because Mistweavers can be very strong single-target healers, but I rarely need to push myself. Of course, a lot of things go into the amount of damage the tanks take. Beyond encounter design, I’d say the wild card for incoming damage is group experience. Players with a good feel for their class and the encounter will be better able to avoid any avoidable damage, meaning less damage on the group. Every group will be a little different, and it’s entirely possible that you’ll never see a group that quite matches my experiences. Still, I don’t think Uldir encounters require serious single-target healing. The tanks need healing, of course, but it’s keeping the whole group alive that feels like the challenge. Is it true that you hate Mitchmas and that your smile grew three sizes? I’m not sure about three sizes, but I did smile. I hope your holidays were all happy ones, Queuevians!